As the pioneer of ‘folding roof cars’ with its elegant 401, 601, and 402 Eclipse models from the 1930s, Peugeot now reveals details of its latest coupé cabriolet, the 308 CC. The new Peugeot 308 CC will be the star of this year's Paris Motor Show in September. The 308 CC, with its four full-size seats, capitalises on all the inbuilt strengths of the 308 range while still embodying the ‘307 CC spirit’ and Peugeot's coupé cabriolet expertise. Above all, it promises enthusiasts of ‘lifestyle’ motoring a unique and genuinely attractive offer. 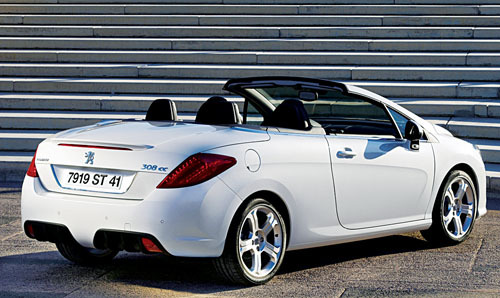 The 308 CC stands out due to its elegant and stylish design, both in its coupé and cabriolet configurations. A low sporty profile confirms the dynamic potential of the 308 CC and the prominent shape and spectacular LED rear lights create a unique signature for the car by day and by night. The deeply sculpted and supportive front seats, with their integral head restraints, have an inbuilt air vent which diffuses warm air around the occupant's neck. The rear seats also mirror this distinctive design and offer rear accommodation that is surprisingly generous for a cabriolet. The 308 CC will be available with both simple and an integral leather interior trim. The entire passenger compartment is now also trimmed in leather, which is unusual in this segment. Meticulously designed to enhance the day-to-day comfort and convenience of its occupants, the 308 CC offers a multitude of everyday benefits, such as the fully automatic retractable roof that can be magically transformed in 20 seconds, four full size seats with increased rear leg room, excellent structural rigidity, usable boot which includes a number of dedicated storage spaces (including one under the boot carpet designed to hold the optional wind stop ), and it has a capacity of 465 litres, or 266 litres with the roof folded. The Peugeot 308 CC will be available in Ireland later this year. Prices and final specifications will be announced closer to the time.